Puerto Banus owes its name to Jose Banus, who was the one that named it. Today, to talk about Puerto Banus is to talk about luxury, glamorous parties and high prices, although if you search a little, you may find reasonable prices for any pocket. Banus is the chosen place for many rich and famous people from all over the world, so if you come to visit keep your eyes wide open, as you might spot your favourite actor visiting too. The Puerto Banus area is is surrounded by fashion boutiques and restaurants, and if we go for a walk we’ll also spot some luxurious cars and yachts that are hard to find anywhere else. If we are looking for something more “down to earth”, we can also fin several cafes and restaurants for all kind of tastes where we can just have a simple hamburger and chips. For those who would like to go and watch a film, there is also a cinema in Puerto Banus where they usually offer films in their original versions and subtitled. If you visit Puerto Banus, prepare yourself to see the most exotic cars, amongst them unknown models and the more “common” brands we all know such as Ferrari, Lamborghini, Bentley, Aston Martin,...and if you’re going shopping, Banus is the perfect place to find top clothing brands like Versace, Ralph Lauren, Hermes, and many other brands that we might not be able to find anywhere else, only in Puerto Banus. If your budget is way below the level of the top brand clothing, you can always visit the Corte Ingles in Marbella or the La Cañada Shopping Centre. Both Puerto Banús and Marbella are the choice of the rich and famous with fashionable designer boutiques and restaurants, luxury yachts and cars. 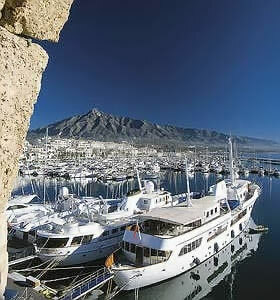 Puerto Banús is next to Marbella and 57, 8 km west from Malaga airport. Taking a bus from Malaga airport to Puerto Banus may not be the most convenient method of transportation if you have a lot of luggage;the bus has a main stop at the bus station in Marbella, and can take much longer to arrive that going by car. you have the option to take the Estepona bus which stop at Puerto Banus or to make a transfer in Marbella. You can take a Taxi from Malaga airport to Puerto Banus, with an aproximate cost of 70 Euro which is expensive if you think you can rent a car a whole week for that money. Currently there is no link by train from Malaga to Puerto Banus.. Car hire at Malaga airport may be a nice and cheap option if you also plan to visit Malaga and Puerto Banus surroundings. 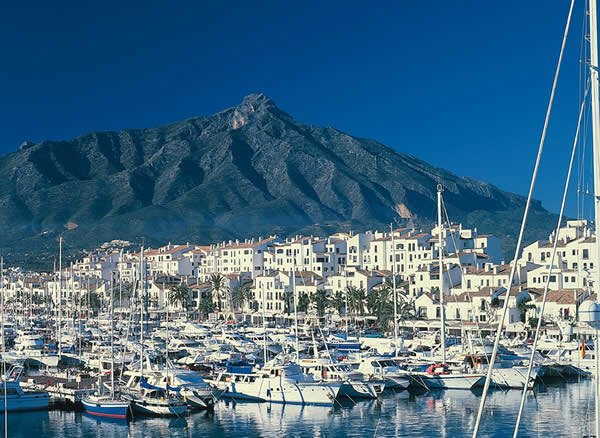 Transfers from Malaga airport to Puerto Banus is a fast and confortable way if you don´t need to hire a car. Continue reading in how to get from Malaga airport to Puerto Banus ,it could be of help if you are looking for the road route, and if you still have questions like how to go from Puerto Banusto Malaga airport don´t hesitate in contacting us in the Malaga transportation forum. Feel free to check our forum for the most updated Puerto Banus reviews and experiences or post your own!. We are always more than happy to know from your experiences and reviews of Puerto Banus. Puerto Banus is a place you will not forget, remember to share your Puerto Banus reviews with us. In Puerto Banus as well as in Marbella, we can find the most selected and luxury Puerto Banus beach clubs and nightclubs in Puerto Banus. We can find a complete selection of restaurants in Puerto Banus: romantic restaurants, international cuisine (Thai cuisine, chinese, italian...), typical spanish restaurants...Puerto Banus restaurants are for all budgets, we will be able to find one which adjust the best to our budget and needs. Our recommendation is to take special care with mayonnaise during the summer. Whilst most restaurant menus are in Spanish and English (at least), attempting few words in Spanish will endear you well among locals. When using a credit card you will be asked for photo identification. Driving license with photo, national identification card or a passport are all acceptable.